Thank you for joining me on a visual tour of the Albuquerque Fiber Arts Fiesta. 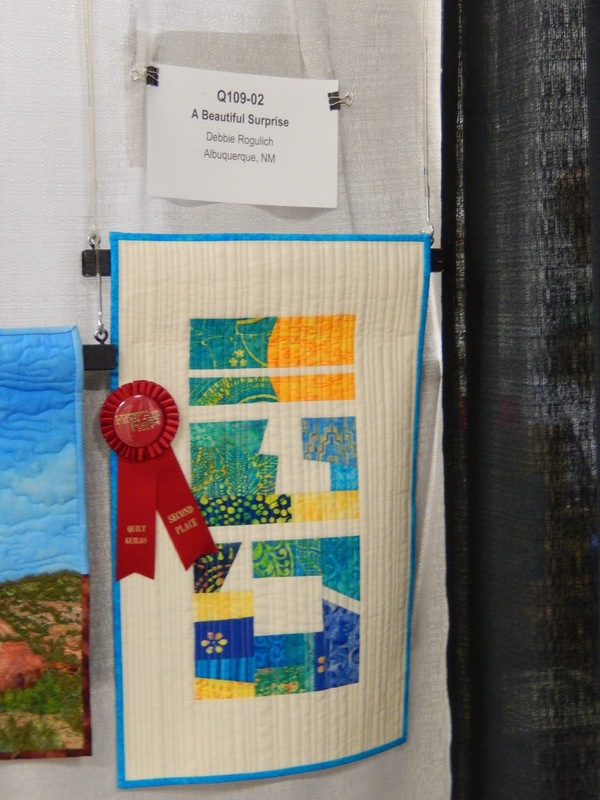 Today we're checking out winning quilts from the Pictorial and Art categories. First Place was awarded to Not Quite 50 Shades of Gray, a monochromatic study done using commercial fabrics and raw edge appliqué, by Lynn Rogers. 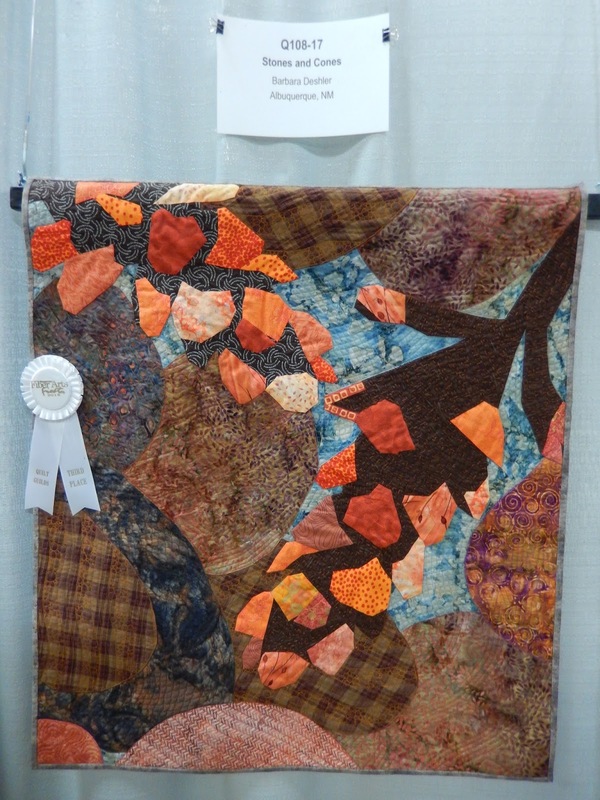 A Beautiful Surprise by Debbie Rogulich, earned second place for its improvisational pieced blocks. Batik fabrics, straight line quilting, and random row widths were also employed. 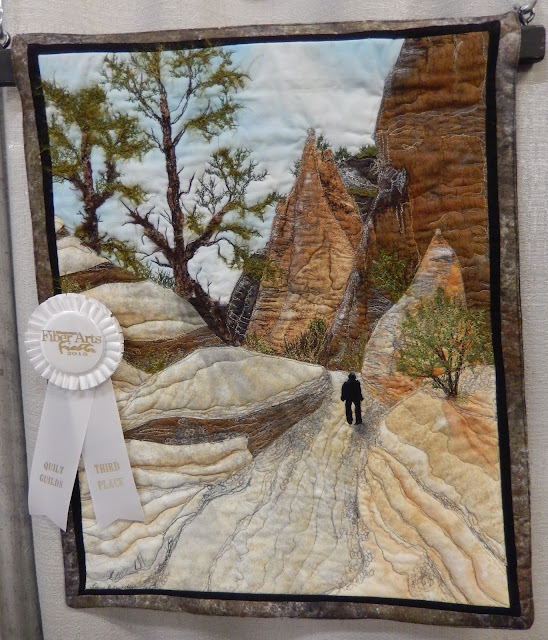 Tent Rock Canyon by Laura Gilmartin was machine appliquéd and thread painted on a longarm. 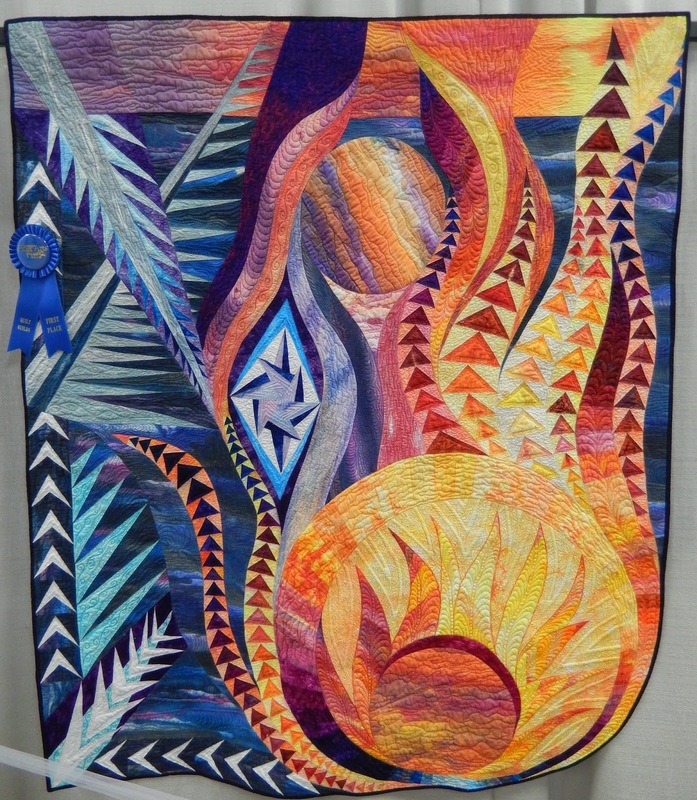 Tsukineko inks, couched yarns, and Intense pencils accented the third place award winner. 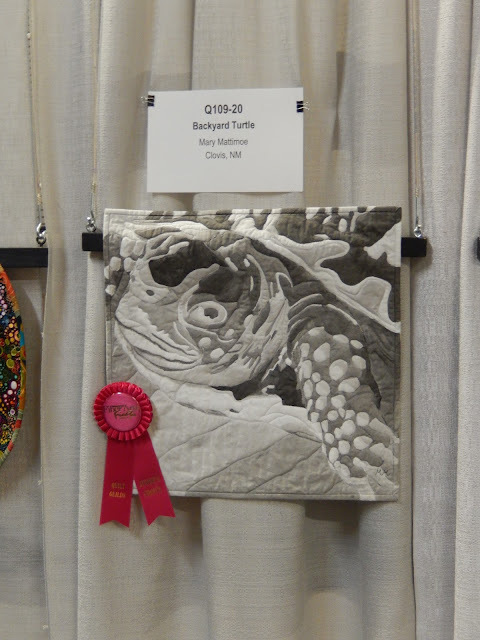 Judge's choice went to Mary Mattimoe's original design, Backyard Turtle. Set Fire to the Rain, the first place winner, is a beading phenomenon. Discharge dye, handprinted cotton sateen, lace, silk thread, glass and copper beads, hand reverse appliqué, and machine piecing were all incorporated. The piece is an original design by Nancy Steidle. Wendy Garrison's original design, Tree of Life, received second place. It displays an unconventional trapunto technique topped with a layer of organza and embellished with beading and oil paints. 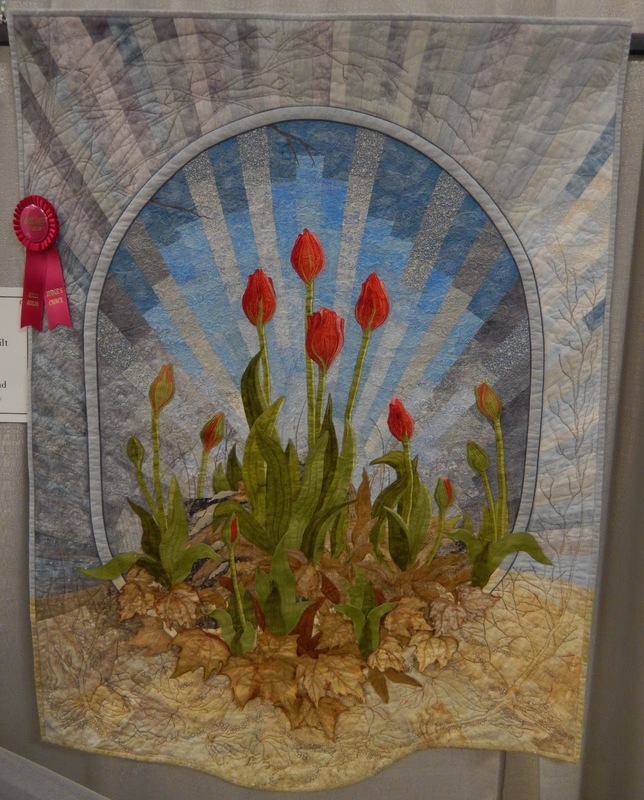 How My Garden Grows by Lynne Horpedahl, the third place winner, was inspired by classes with Luara Wasilowski and Mary Lou Weidman. We're Not in Kansas Anymore, Norma Koelm's original design, was hand appliquéd and hand quilted. It was honored with judge's choice. First place was awarded to Kamchatka by Nancy Steidle. Materials used to create exquisite detail included cotton batiks, wool yarns, pearl cotton, silk ribbon, and glass beads. Hand reverse applique, embroidery, beading, machine piecing, quilting, and felting techniques were employed. Graces Jumping for Joy received second place. Barbara Bogart pieced the background and appliquéd the figures. Third place went to my daughter's favorite piece in the show, My Three Bassets by Shari Schmitt. 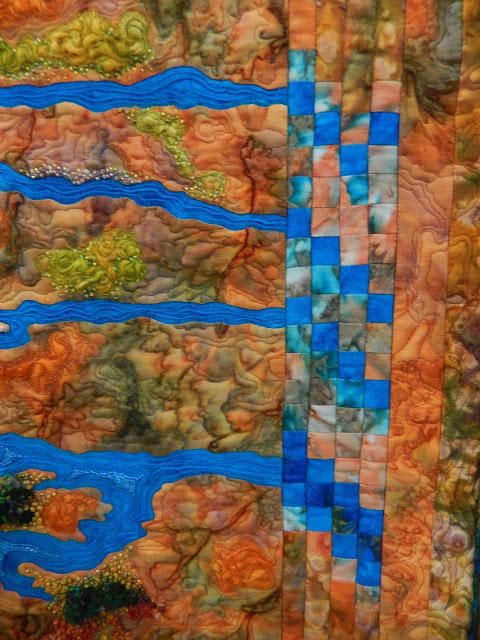 Photographs were used to create this original appliqué and pieced quilt. Changing Seasons by Utha J. Russell received Judge's Choice. This original piece was quilted on a domestic machine and embellished with Shiva Paintstiks and thread painting. Gail Garber's textile expression of sudden changes in our warming world, Climate Change, took the top award in the Large Art category. Second Place went to Judith Roderick, Featured Artist of the 2015 Fiber Arts Fiesta, for Two Creatures. It consists of black silk and over-dyed handprinted silks with rich embellishment. Enchantment in the Jungle by Jean Brueggenjohann was the third place winner. It is a machine and paper pieced original work with hand appliqué, hand embroidery, glass beads, sequins, sparkly tulle and African fabric. It was quilted on a domestic machine by Jean. Judge's Choice went to Purple Haze by Jean Grimes, a snow dyed and discharged cotton piece with crackle technique. Raw edge appliqué, silk fibers, beads, and glitter were added after quilting. Alpine Forget-Me-Nots by Annette Kennedy features fused appliqué, hand painting using transparent textile paints, and machine quilting. This original piece won first place. Second place was taken by In a Mermaid's Garden by Lynda Visage. It's embellished with charms, ribbon, yarns and yo-yos. 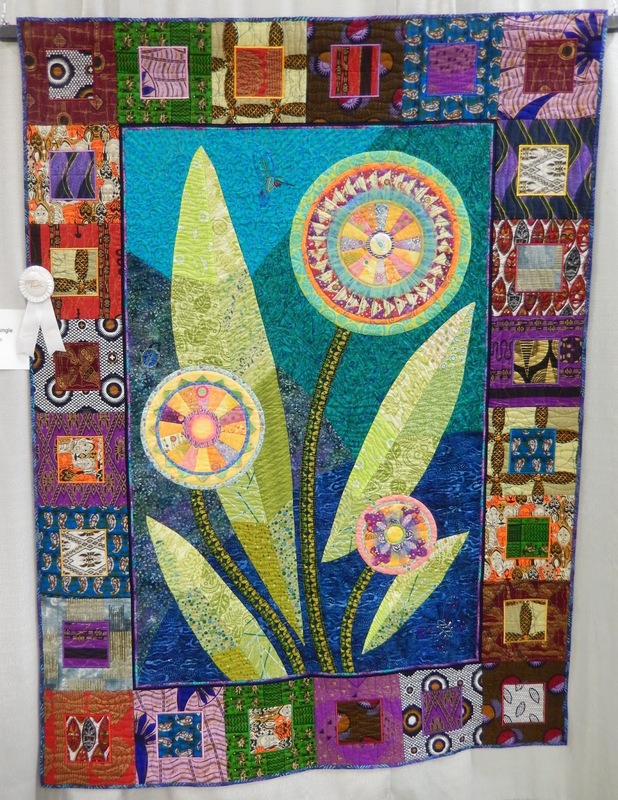 Barbara Deshler's Stones and Cones came in third with a combination of machine (piecing and quilting) and hand (appliqué and embroidery) work. I can only imagine the time that went into each piece. So much talent! These are beautiful.